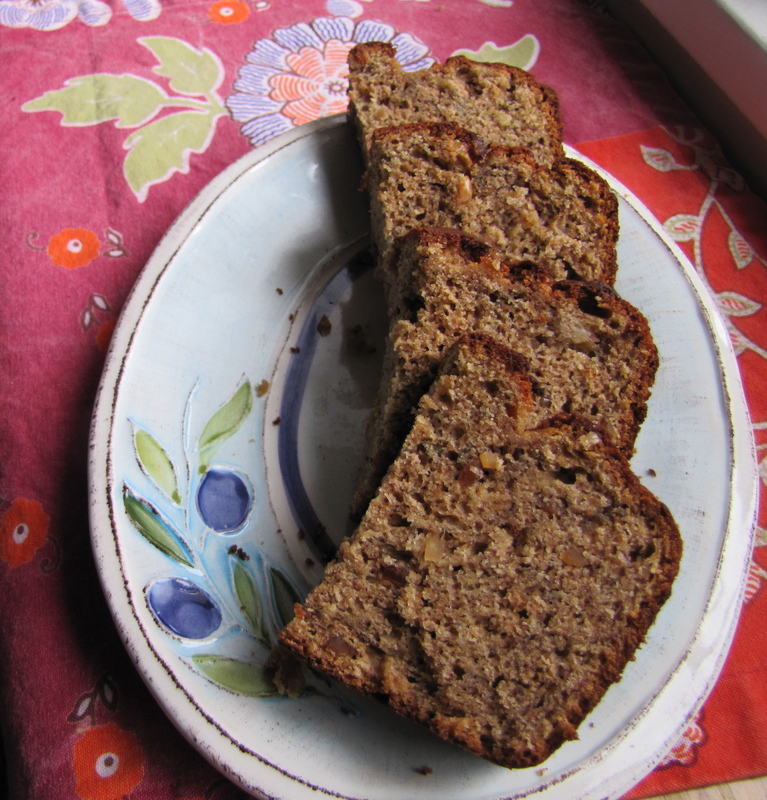 Peanut Butter Banana Bread – Voila! There was a time in my life when the combination of banana’s and peanut butter did not appeal to me. The mixture of these two soft, creamy consistencies did not thrill me. I liked each of these ingredients separately but I couldn’t have them together in their natural state. Then, as you have probably guessed, my taste buds changed and I fully embrace this synthesis of flavors and consistencies. These flavors have now been taken to the next level and shaped into a delicious, moist quick bread that would even satisfy my old taste buds. Preheat to 350 degrees F. Grease a 9×5-inch loaf pan. Line with parchment paper. Set aside. 1. In a large bowl, whisk together flours, baking soda, salt, ground cinnamon and ground allspice. 2. In a medium bowl, whisk together mashed bananas, yogurt, peanut butter and melted butter. Whisk in eggs and sugars. Blend mixture until no sugar lumps remain. 3. Pour the wet mixture into the larger bowl with the dry ingredients. Fold together with a spatula until no more flour bits remain. Fold in the chopped nuts as well, if using. 4. Pour the batter into the prepared baking pan and cake for 50-55 minutes, or until a skewer inserted into the center of the loaf comes out clean. Remove from the oven and allow to cool. Note: This bread lasts, well wrapped at room temperature,for up to 4 days. It is also great to store, well wrapped, in the freezer. We met over icecream with the Grambows…I’m Kari’s mom. I soooooo enjoyed your blog…there are too many things to try, but I’ll do my best. Happy Passover! Dianne – So glad you like the blog! Hope y’all enjoyed the rest of your trip in D.C. Let me know what you cook and how it turns out!